It was sunny and warm when we started our walk at 9:00am. 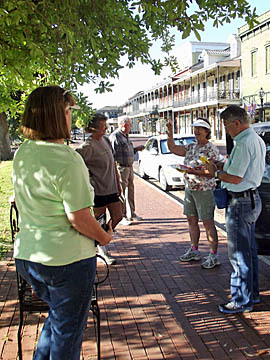 The walk started at the Visitors’s Center on Front Street. The walk went down to a park along the river. 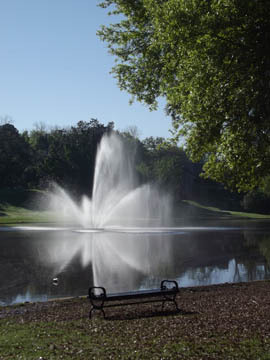 I liked this fountain in the middle of the river. The walk continued onto the Northwestern State University Campus, coming back into town we went into the cemetery where the funeral scene for Julia Roberts (Steel Magnolia’s) was filmed. Walk continued into town were we went down Church street. I think there where at least five churches all there close together. We also passed the parrish courthouse and then continued out to the old Railroad Depot. 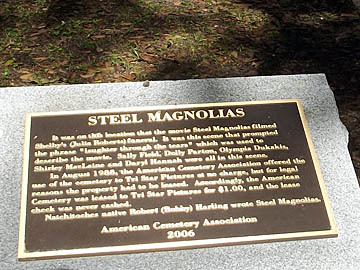 This entry was posted in Louisiana, Natchitoches, Steel Magnolias, volksmarching, walking and tagged Louisiana, Natchitoches, Steel Magnolias, volksmarching, walking. Bookmark the permalink.